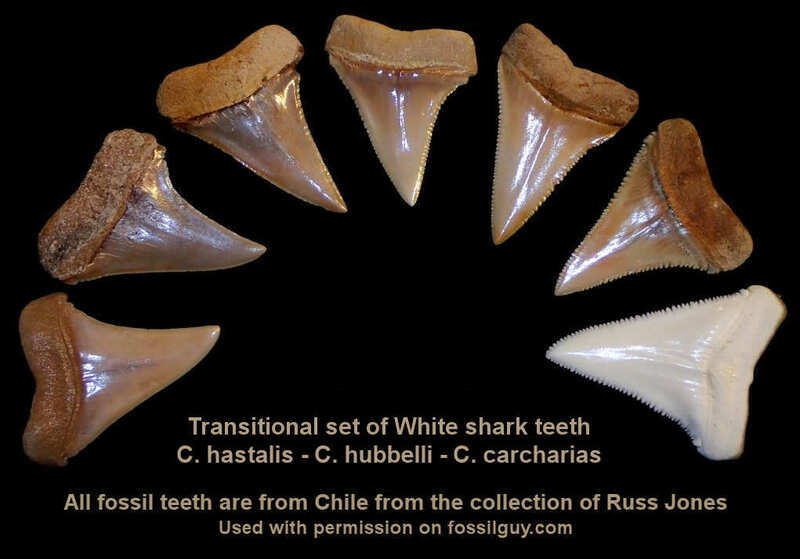 This image shows various Prehistoric White Shark Species: C. carcharias - C. hubbelli - C. plicatilis - C. hastalis - C. planus - C. escheri. *Escheri tooth from Lutz Andres *Hubbelli tooth from Russ Jones. The evolution of the White shark has been hotly debated for over 30 years. 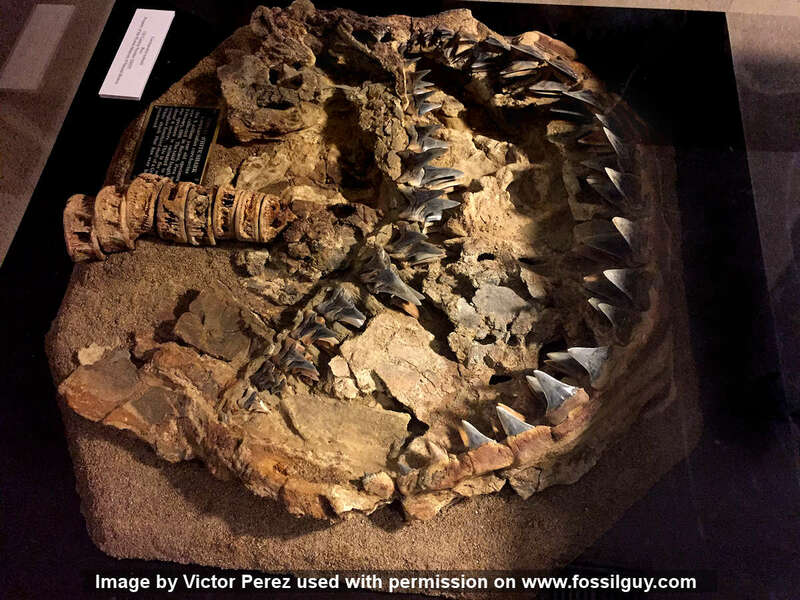 Since fossil evidence mainly consists of isolated teeth, research is difficult and there is currently little consensus on the names of a few of the White shark genus and species. As a result, this article is intended to give a general overview of current research on White shark evolution and some of the representative species. Prehistoric White sharks first appeared in the early Oligocene when they diverged from the Mako sharks. They are thought to have diverged from an Eocene shark called Macrorhizodus americana (M. praecursor). Early Whites are represented by a scarce fossil species called flandricus that is often found in the Boom Clay of Belgium. This species has a genus name of either Isurus, Macrorhizodus, Cosmopolitodus, or Carcharodon depending on who one asks! 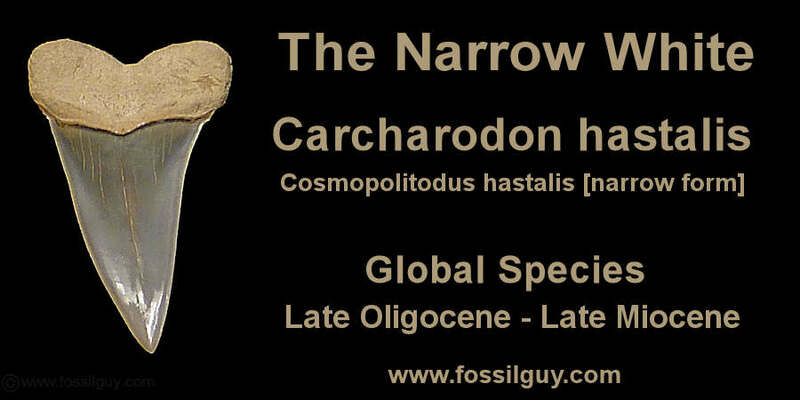 By the late Oligocene, a White shark called Carcharodon hastalis (aka Cosmopolitodus hastalis [narrow form]) emerged. C. hastalis lasted well into the late Miocene and may have given rise to two other Miocene species, C. planus of the Pacific, and C. subserratus (C. escheri) of the Atlantic. By the beginning of the Pliocene, another White shark had diverged from C. hastalis. This shark is called Carcharodon plicatilis (aka C. xiphodon / Cosmopolitodus hastalis [broad form]). C. plicatilis was a broad version of C. hastalis. This broad form White shark is thought to have given rise to C. hubbelli and eventually the living Great White, C. carcharias. Upper Carcharodon hastalis (Cosmopolitodus hastalis [narrow form]) - Narrow White shark tooth from the Calvert Cliffs of Maryland. C. hastalis is a narrow tooth form of the White shark. It's another large species that existed in the late Oligocene into the late Miocene and is also a nearly global species that ranged from both coasts of North America, South America, Europe, Asia, and Australia. Numerous White shark species are thought to have branched from this shark, including planus, subserratus, and later plicatilis. This is a popular tooth to find in the Pungo River formation at Aurora, which is accessible in the spoil piles at the Aurora Fossil Museum. A remarkable hastalis specimen was found and described by Collareta et al. (2017). The specimen, labeled CPI-7899, is a juvenile C. hastalis that came from the late Miocene of Peru. The well-preserved specimen even has fossilized fish in its stomach. The research shows this shark's feeding habits were consistent with modern juvenile Great Whites and Mako sharks. C. hastalis teeth have a wide and triangular crown. They look similar to C. plicatilis teeth but are not as broad. The blade is smooth (no serrations) and the enamel does NOT go to the very edge of the root, like in C. plicatilis. The roots are also longer than in C. plicatilis. See the images below for identification. 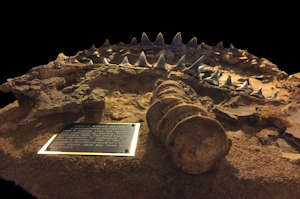 Locations where these fossil shark teeth can be found include the Calvert Cliffs, Aurora, NC, Venice Beach, FL, and the Peace River, FL. This is figure 2 from Collerata et al, 2017 showing a well preserved C. hastalis (Specimen CPI-7899) from Peru. This juvenile specimen has preserved stomach contents. Carcharodon hastalis ( Cosmopolitodus hastalis [narrow form] ) upper and lower shark tooth positions - Labial side of teeth shown - all teeth collected from Aurora, NC. 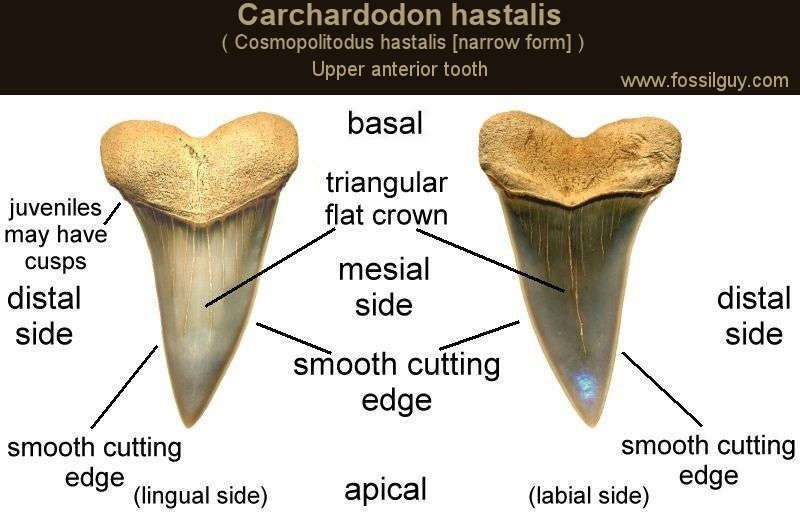 Carcharodon hastalis ( Cosmopolitodus hastalis [narrow form] ) upper anterior shark tooth diagram. Shark tooth from the Calvert Cliffs of Maryland. 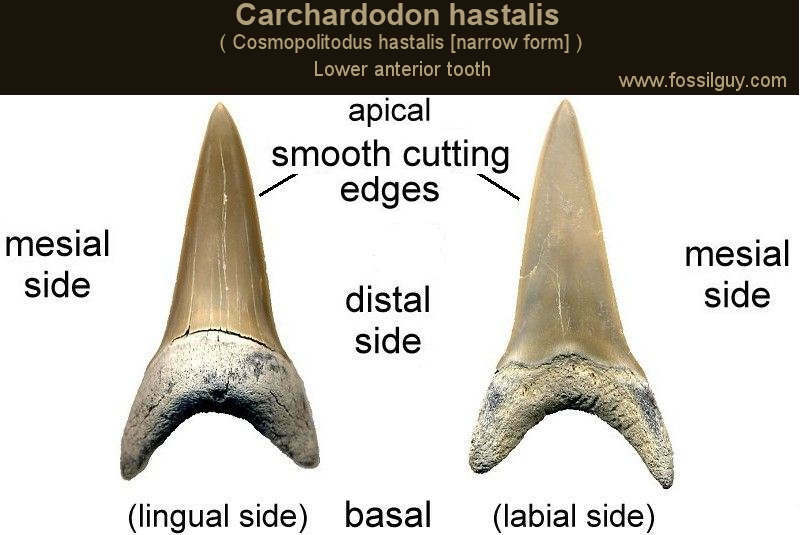 Carcharodon hastalis ( Cosmopolitodus hastalis [narrow form] ) lower anterior shark tooth diagram. Shark tooth from the Pungo River formation of Aurora, NC. C. planus, or the Hooked White, appears to have diverged from C. hastalis during the late Oligocene. This is a short-lived species that only lived in the Pacific. The first report of C. planus comes from the late Oligocene of Australia (Kemp, 1991). Specifically, they come from the Jan Juc Marl near Bird Rock, which lies just below the Oligocene/Miocene contact. Fossilized teeth are more commonly found in Miocene sediments around the Pacific, such as Mexico, California, Australia, Japan, and Sakhalin Island, Russia (Nazarkin, 2013). 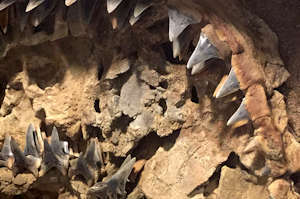 Sharktooth Hill, near Bakersfield, California, is a famous location to find these teeth. These teeth look very similar to hastalis teeth. The lower teeth are virtually indistinguishable from lower hastalis teeth. The upper teeth are similar in shape to hastalis; however, the blade has a noticeable hook which produces teeth that bend toward the rear of the mouth. Refer to the image below for identification. 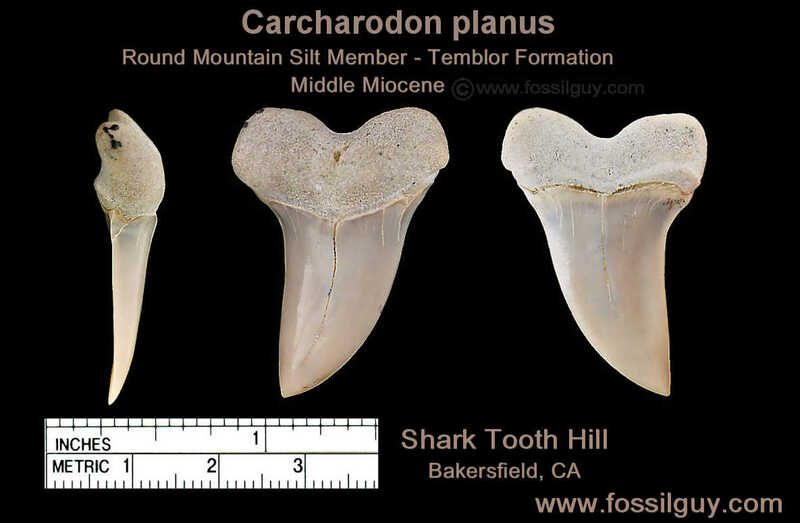 Carcharodon planus upper tooth from Sharktooth Hill in Bakersfield, CA. This tooth is approximately 1.5 inches in height. Notice the distinct hook in the blade. 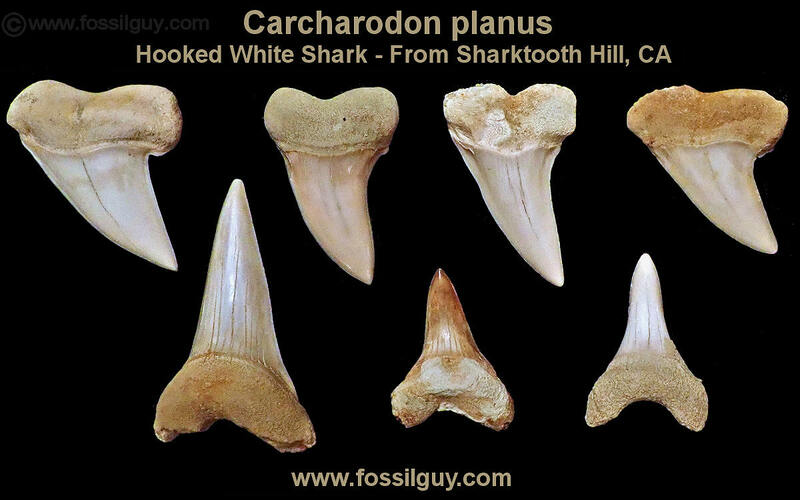 More examples of Carcharodon planus teeth from Sharktooth Hill in Bakersfield, CA. The lower teeth are virtually indistinguishable from C. hastalis lower teeth. So, the lower tooth imaged may be a C. hastalis instead. Carcharomodus escheri shark tooth from the Netherlands. This beautiful blue upper anterior tooth is from the collection of Russ Jones. C. escheri (C. subserratus) had teeth with very weak serrations, sometimes crenulations, sometimes cusps, and even cusps with crenulations! This shark ranges from the mid-Miocene into the early Pliocene and is found only in Atlantic and Mediterranean deposits, including Spain, the Netherlands, Belgium, Germany, the eastern United States, and possibly South Africa (Per. Obs.). Although C. escheri had developed slight serrations, it is not a transitional form of the modern Great White shark. This prehistoric shark was originally thought to be closely related to the Mako sharks and was given various genus names to reflect this, such as Oxyrhina and Isurus. When the evolution of Great Whites became clearer in the 1990's and early 2000's, there was debate about either moving it to the Carcharodon / Cosmopolitodus genus with the White Sharks or keeping it as a mako shark in the Isurus genus. The later thought was that it was a Mako shark that independently evolved weak serrations. But wait, it's not over! More recently, Kent and Ward (2018) looked into the taxonomic nomenclature of this shark and rejected the entire genus and species name of Carcharomodus escheri. They looked at sample teeth from Europe and North America and found the teeth are very similar to the to the narrow form C. hastalis of the Miocene. They also recognized the associated German specimen had "substantial variation" in the teeth. Because of this, the authors found "little justification for this new, monotypic genus." 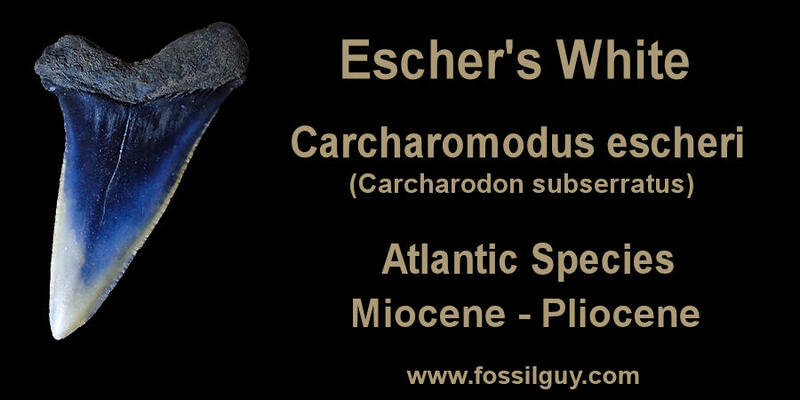 In other words, escheri should be placed with the rest of the White sharks in the Carcharodon genus and not a new Carcharomodus genus. As far as the species name, it boiled down to a misidentified tooth. Before Agassiz named escheri, he had named a separate shark tooth subserratus. However, Kent and Ward suggest this tooth is likely an upper anterior tooth of escheri. Because subserratus was named earlier, this name takes precedence over escheri. As a result, Kent and Ward used Carcharodon subserratus for the name of this shark. 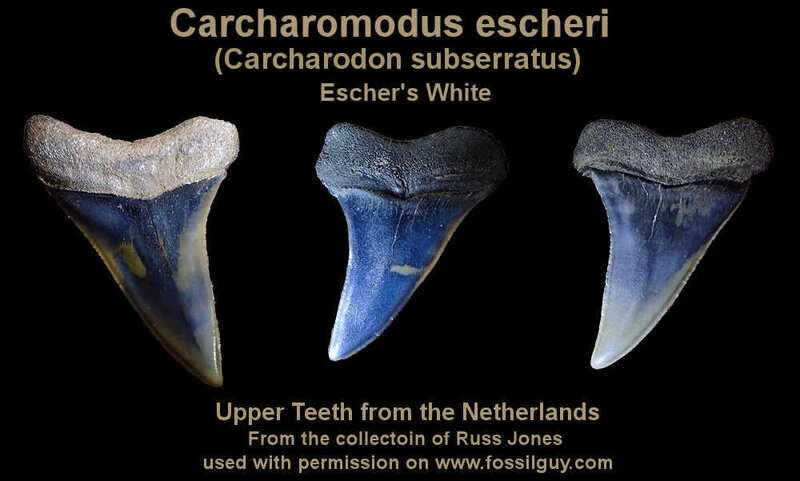 C. escheri has a very similar dentition to juvenile C. carcharias sharks. 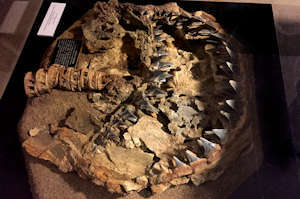 The actual shape of the teeth look similar to C. hastalis (the Miocene narrow form White Shark) with the addition of very light serrations and cusps, or sometimes crenulations. Cusps are often present even in adult teeth. Refer to the images below. This is the adult specimen MNU 071-20 that is on display at the Museum fur Natur und Umwelt in Germany. It is the most complete C. escheri specimen known. Image from Kriwet et al. 2015 - Figure 2A. Upper teeth of Carcharomodus escheri from the Netherlands. These shark teeth are from the collection of Russ Jones. They have very fine serrations running down the blades. Upper Carcharodon plicatilis - Giant White shark tooth from Aurora, NC. This shark is commonly called the Giant White or sometimes the Broad White. It's the largest shark in the White shark lineage. The teeth can reach sizes over 3" and are on average slightly larger than Great White teeth. This shark is thought to have diverged from C. hastalis in either the late Miocene or the early Pliocene. It became extinct at the end of the Pliocene with other large sharks. 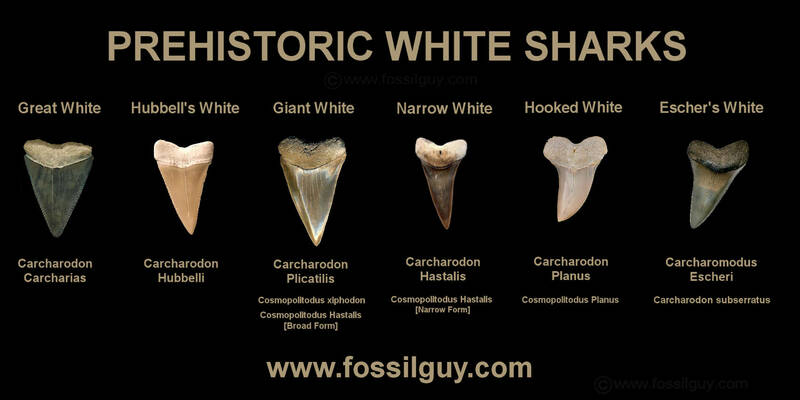 The Giant White had a nearly global distribution as fossil teeth are found in North and South America, Europe, Asia, Australia, and the Pacific. This is a popular tooth to look for in the Yorktown formation at Aurora, NC. The name of this shark is probably one of the most debated shark names in paleontology. It has gone through numerous name changes and is still a matter of debate between paleontologists. This section is meant to briefly highlight the origins of some the main name changes, since it leaves many amateur fossil collectors rather confused. Originally, this shark was thought to be a mako shark and was called Isurus hastalis. There was a 'broad form' and a 'narrow form.' This particular shark was the 'broad form' Isurus hastalis. 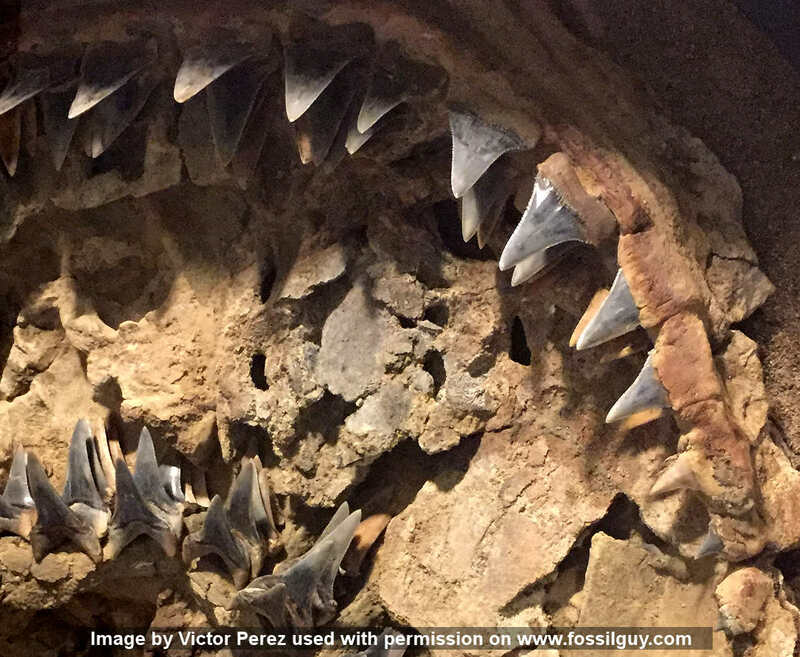 More recently, from research and new fossil discoveries in the late 1980's to the early 2000's, paleontologists realized this shark is closely related to the Great White shark, and therefore belongs to the White Shark lineage, not the Mako lineage. To reflect this change, the genus Cosmopolitodus was resurrected from a paper by Glukman (1964). In 1996, a paper by Purdy recognized the many differences between the broad and narrow forms and separated the two sharks. He erected the species name xiphodon for the broad form. Here the name Cosmopolitodus xiphodon was born. However, in 2001 a paper by Ward and Bonavia considered the species name xiphodon to be "nomen dubium" because of taxonomic issues including with the lack of a type specimen. Then in 2010, Whitenack and Gottfried wrote a paper that supported the use of the name C. xiphodon. In that same paper by Whitenack and Gottfried, they also cleaned up the genus name; instead of using Cosmopolitodus genus, they used the genus Carcharodon to reflect the very close relationship between this shark and the Great White shark. Jumping to 2012, a paper by Ehret et al., rejected the xiphodon name and went back to the shark being a 'broad form' of the hastalis shark, due to sexual dimorphism. But then, that same year, Cione et al. (2012) wrote a paper that recognized the many differences between the 'broad' and 'narrow' forms, and separated the sharks into two species again. This time, instead of using the invalid xiphodon species, they went to, what they considered, a valid species name that Agissiz coined in 1843. 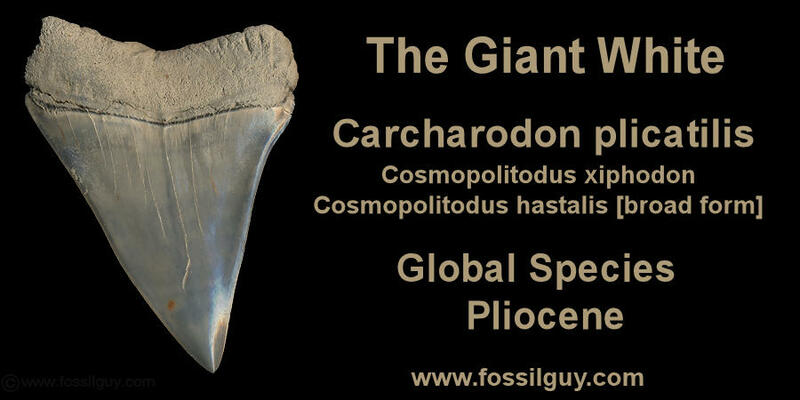 This valid species name is called plicatilis... Carcharodon plicatilis. Also of note, C. plicatilis was erected based on Pliocene teeth. For instance, as Kent and Ward (2018) concur, C. plicatilis is not found at the Miocene Calvert Cliffs. Although many Calvert Cliffs specimens have broad crowns like C. plicatilis, there is an "absence of the plicatilis tooth morphology in small individuals and lateral teeth of large individuals" at the cliffs. So they support C. plicatilis to only be used for Pliocene teeth. There you have it, a quick rundown of many of the proposed name changes. Today, depending on which paleontologist you ask or which scientific publication you read, it will go by any one of those names. Th Giant White shark has a very wide and triangular blade (crown). The blade is smooth and the enamel goes to the very edge of the root. The roots are a little shorter and less robust looking than the hastalis shark. 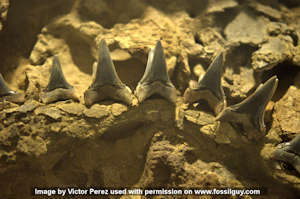 Refer to the upper and lower shark tooth identification images below. 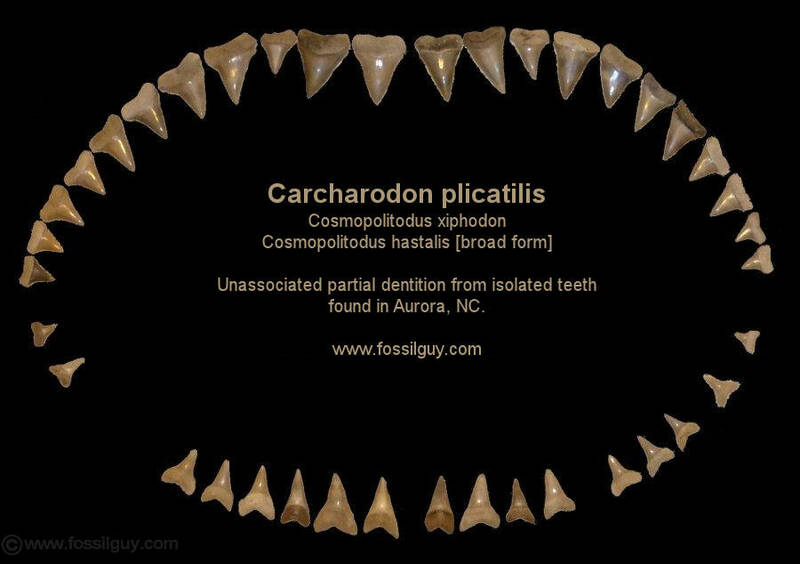 Carcharodon plicatilis ( C. xiphodon / C. hastalis [broad form] ) upper and lower tooth positions - Labial side of teeth shown - all teeth collected from Aurora, NC. 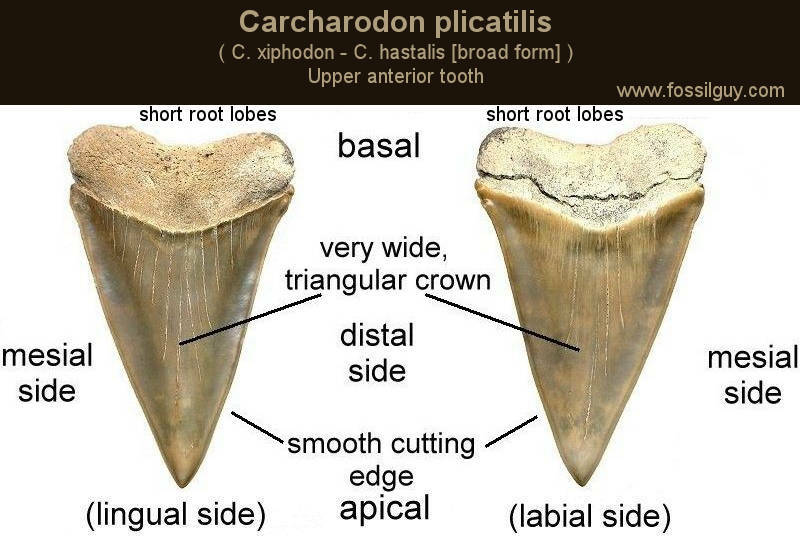 Carcharodon plicatilis ( C. xiphodon / C. hastalis [broad form] ) upper anterior shark tooth diagram. Shark tooth from the Yorktown formation of Aurora, NC. 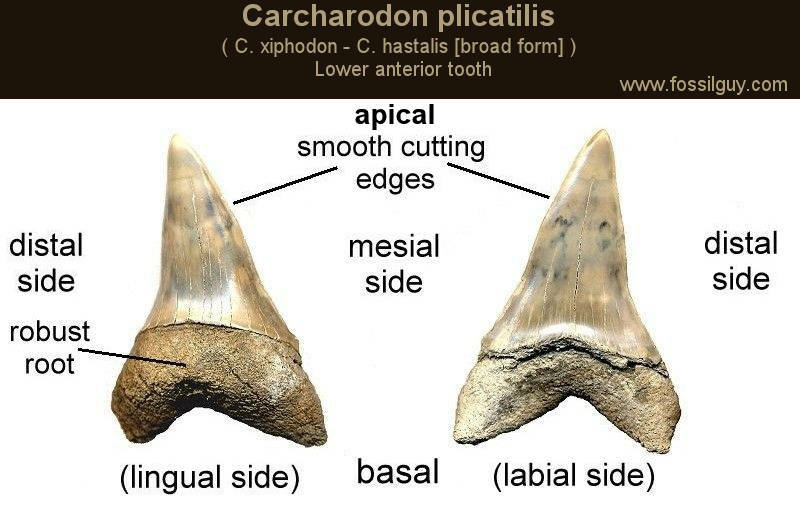 Carcharodon plicatilis ( C. xiphodon / C. hastalis [broad form] ) lower anterior shark tooth diagram. Shark tooth from the Yorktown formation of Aurora, NC. Carcharodon plicatilis ( C. xiphodon / C. hastalis [broad form] ) unassociated partial dentition from isolated teeth collected at Aurora, NC. C. hubbelli is found in late Miocene formations of the in the eastern Pacific. They were originally described from the Pisco formation of Peru, but are also found in the Bahia Inglesa Formation of Chile and even the Purisima formation in Central California (Boessenecker, 2011). Although originally thought to be an early Pliocene shark (Ehret et al., 2009), an age calibration shows this shark is late Miocene in origin, making it about 6 - 8 million years old (Ehret et al, 2012). This updated age estimate places it as an intermediate form between C. plicatilis and the modern Great White shark (C. carcharias). 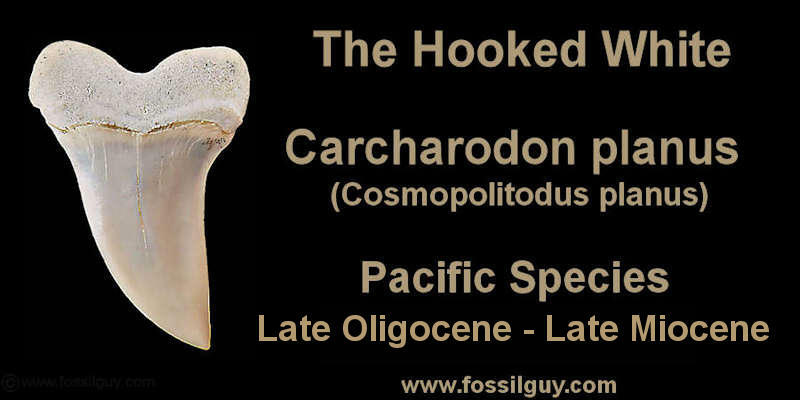 The holotype specimen (UF 226255) was origianally called Carcharodon sp. as it went unnamed for some years. Various publications also referred to it as the "Sacaco specimen" based on the location it was found. The name C. hubbelli came in 2012 when a paper by Ehret et al. (2012) created the species name in honor of Dr. Gordon Hubbell "...in recognition of the substantial contribution he has made to the field of shark paleontology." Dr. Gordon Hubbell also obtained the holotype specimen from a farmer who found it in 1988. The teeth of C. hubbelli are similar to Great White teeth with some minor differences. The main differences are the teeth have weaker serrations that tend to be strongest at the base of the blade and taper off toward the tip. Another difference is the upper teeth tend to be slightly narrower than the modern Great White. Upper C. hubbelli tooth from the collection of Russ Jones. This tooth is from the late Miocene of Peru. 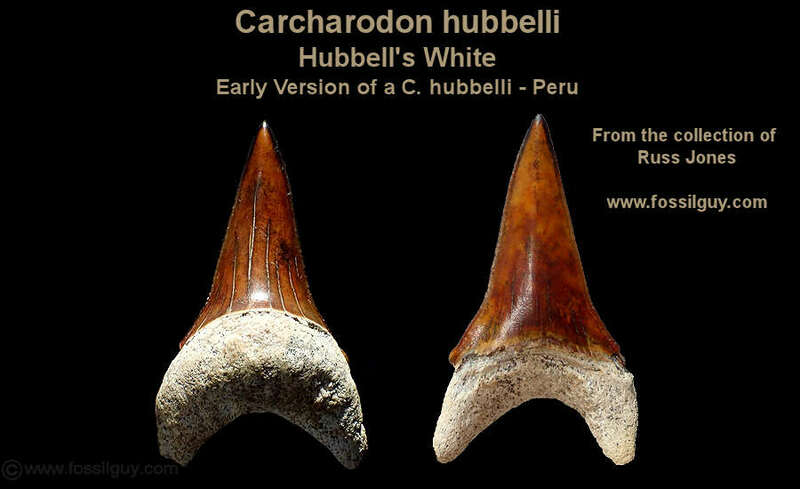 This is an early version of a lower C. hubbelli shark tooth from Peru. From the Collection of Russ Jones. This is a set of transitional teeth starting at C. plicatilis on the left, moving to various stages of C. hubbelli, and ending up with C. carcharias on the right, including a modern C. carcharias tooth. Notice the first evolutionary step is a rippled blade, then serrations become more and more pronounced, until there is a full fledged Great White. All of the fossil teeth are from Chile and are from the collection of Russ Jones, who allowed me to use them on this page. 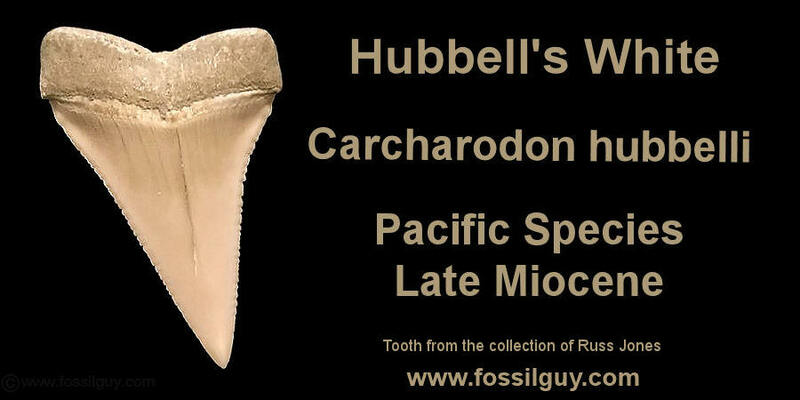 Click on the thumbnails below to see the full sized versions of the C. hubbelli specimen. Upper Carcharodon carcharias - Great White - shark tooth from South Carolina. C. carcharias, the Great White, is the only living White shark. There is now a general consensus that C. carcharias appeared by at least the late Miocene, possibly 6 - 8 million years ago (Ehret 2012). C. carcharias probably diverged from C. hastalis of the Miocene. When first described, the hubbelli specimen was found to have traits more similar to the hastalis shark and not the plicatilis shark, which was then called xiphodon (Ehret et al., 2009). Therefore, a probable transition to C. carcharias from the mid-late Miocene is: hastalis - hubbelli - carcharias. 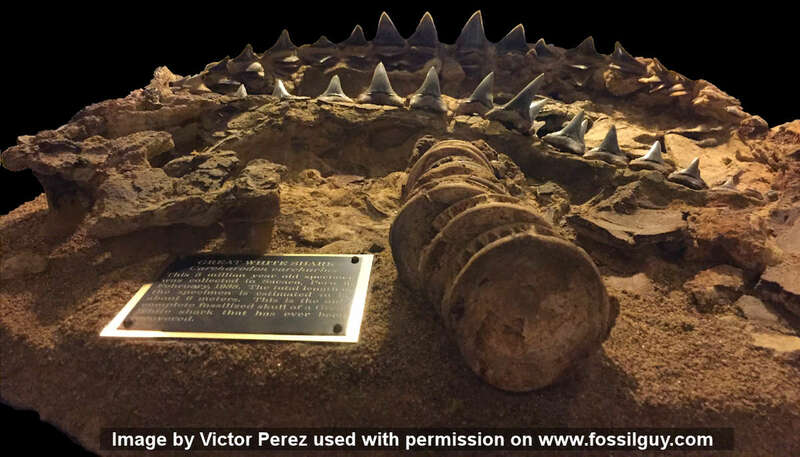 Once carcharias appeared, it seems to have quickly spread, as fossil teeth are found in mid-late Miocene exposures in Brazil, Chile, Argentina, Cuba, and possibly Virginia (Kent and Ward, 2018). 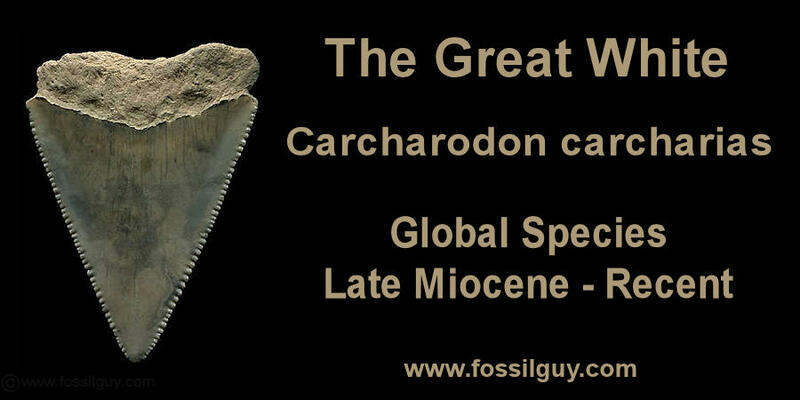 By the early Pliocene, it had a near global distribution. 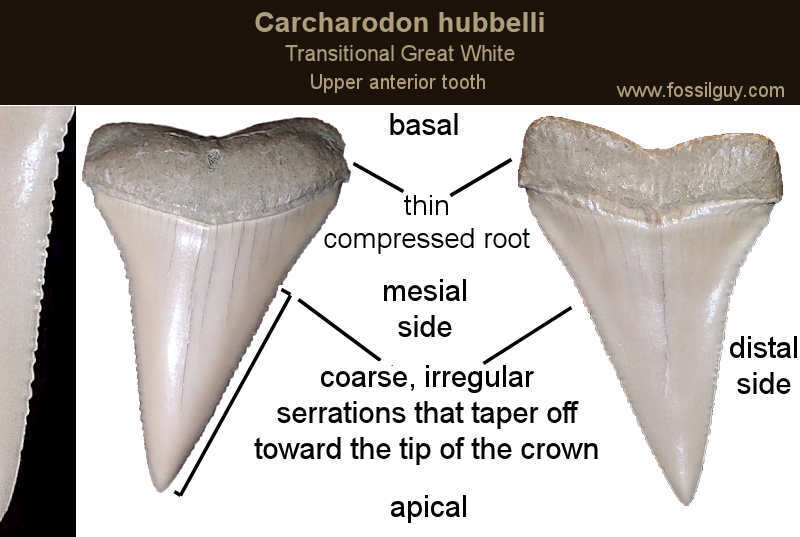 C. carcharias teeth are very similar to teeth of Hubble's White shark, C. hubbelli. The difference, of course, is the serrations. C. carcharias has medium to coarse serrations that are irregular and run the entire length of the blade, whereas C. hubbelli the serrations taper off toward the end of the blade. Irregular means the serrations are not all a constant size as in C. megalodon. Instead, the size of each serration varies, which makes them look a bit jagged. 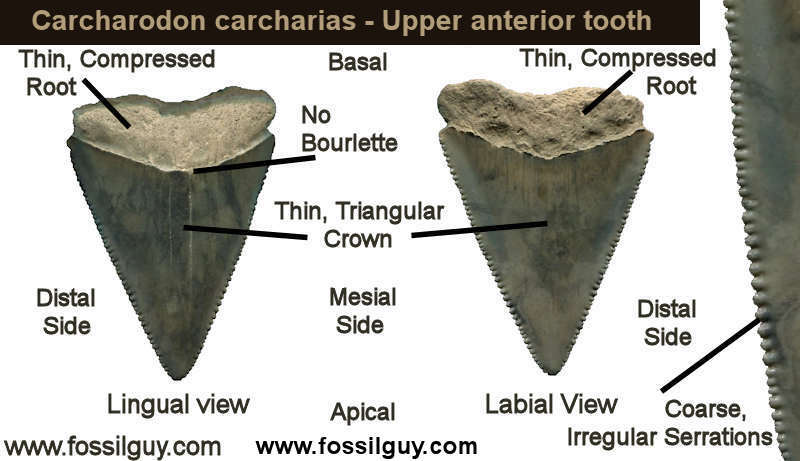 C. carcharias teeth are also slightly broader than C. hubbelli. For detailed information on Great White sharks, go to the Great White gallery. From their divergence from the early Mako sharks of the Eocene to the living Great White today, White sharks have survived the past 34 million years. From narrow to broad forms and non-serrated to serrated forms, they have gone through remarkable adaptations. Although research on White shark evolution is far from complete, today we can at least piece together most of the puzzle. 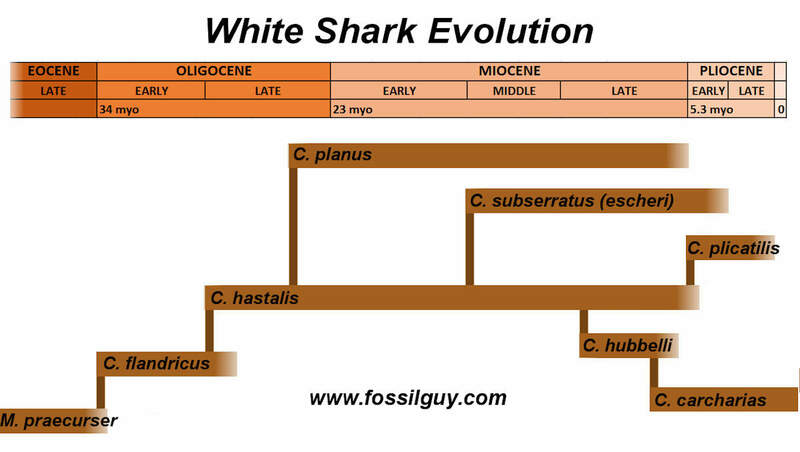 In conclusion, the possible evolution lines of the White shark from the Oligocene to recent times is shown below. Possible evolution lines of the White Shark. This gives a good overview of when each prehistoric White shark species emerged and died. This is a great book about Great White sharks. This 144 page book is geared for a general readers and students and is full of great pictures. The author is a professional photographer who has been researching Great Whites for over 20 years. Desert Sharks, by Mark Renz, takes you to the deserts of Peru in search of prehistoric sharks. This book is full of stunning images and interviews from paleontogists. It traces the evolution of the Great White Shark, which evolved around 4-5 million years ago in what is now the deserts of Peru. This 193 page book also contains a ton of beautiful photographs! It is hard to find now, but sometimes you can come by a cheap used copy. A great book for identifying all those teeth. This book is laid out "as simple as possible." It's ease of use and small size makes it great to carry during collecting trips. 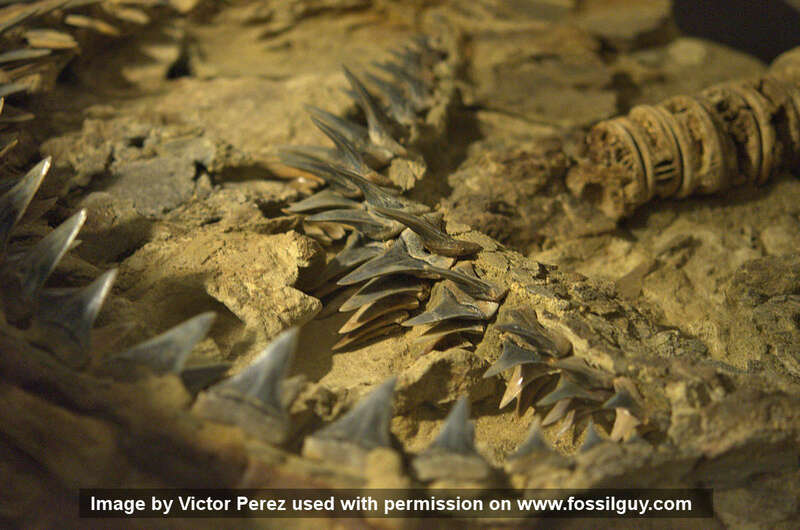 This book gives you and idea of all the kinds of fossil sharks from around the globe. This is an awesome fossil shark teeth shirt for anyone who collects shark teeth! They have a few sizes, styles, and colors. I'd like to give a special thanks to Victor Perez and Russ Jones for the images of various shark teeth and specimens on this page! Boessenecker R. (2011). 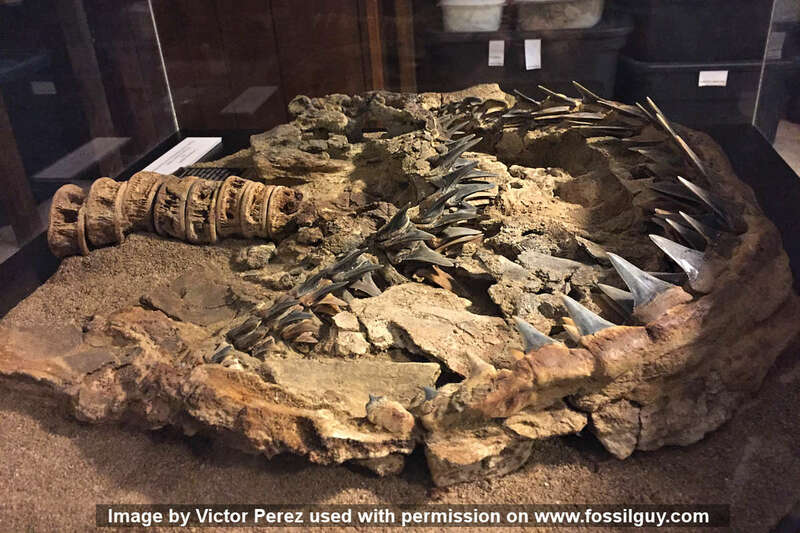 A new marine vertebrate assemblage from the Late Neogene Purisima Formation in central California, Part I: Fossil sharks, bony fish, birds, and implications for the age of the Purisima Formation west of the San Gregorio Fault. PalArch's Journal of Vertebrate Palaeontology. 8. 1-30 PDF Here. Cione A., Cabrera D., and Julia Barla M. (2012). Oldest record of the Great White Shark (Lamnidae, Carcharodon; Miocene) in the Southern Atlantic. Geobios. 45. 167-172. 10.1016/j.geobios.2011.06.002. Gottfried M., Compagno L.J.V., and Bowman, S.C.. (1996). Chapter 7. Size and skeletal anatomy of the Giant Megatooth shark Carcharodon megalodon. pp. 55-66. IN: Klimley, A. Peter, and Ainley, David G. (editors). In: Great White Sharks the Biology of Carcharodon carcharias Academic Press. San Diego, CA. 517 pp. Kemp, N.R. (1991) Chapter 15. Condrichthyans in the Cretaceous and Tertiary of Australia. Vertebrate Paleontology of Australasia, pp. 497-658. Landini W., Altamirano-Serra A., Collareta A., Di Celma C., Urbina Schmitt M., and Bianucci, G. (2016). The late Miocene elasmobranch assemblage from Cerro Colorado (Pisco Formation, Peru). Journal of South American Earth Sciences. 73. 10.1016/j.jsames.2016.12.010. Nazarkin M.V. 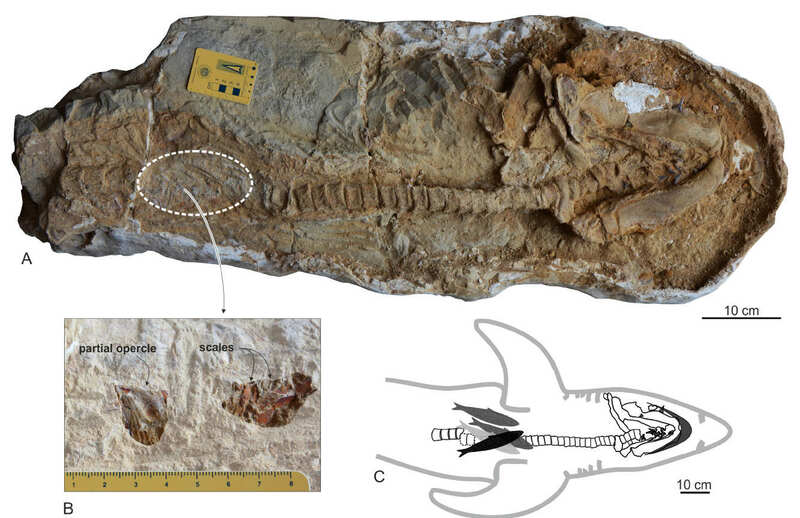 (2013) Hooked Mako Isurus planus (Agassiz, 1856) from the Miocene of Sakhalin. Zoosystematica Rossica, 22(2):311-314. Purdy R., Schneider V., Appelgate S., McLellan J., Meyer R., and Slaughter R. (2001). The Neogene Sharks, Rays, and Bony Fishes from Lee Creek Mine, Aurora, North Carolina. In: Geology and Paleontology of the Lee Creek Mine, North Carolina, III. C. E. Ray & D. J. Bohaska eds. Smithsonian Contributions to Paleobiology, No 90. Smithsonian Institution Press, Washington D.C. pp. 71-202.